Invariant integration features (IIFs) have been proposed as an alternative to the standard feature extraction methods for automatic speech recognition. The IIFs are based on the idea of constructing invariant features by integrating nonlinearly transformed input signals over a finite transformation group. In the context of feature extraction for ASR, monomials up to a certain order are a good choice as nonlinear functions. Experiments showed that the IIFs perform superior compared to MFCCs and PLPs, especially in mismatching training-testing conditions. 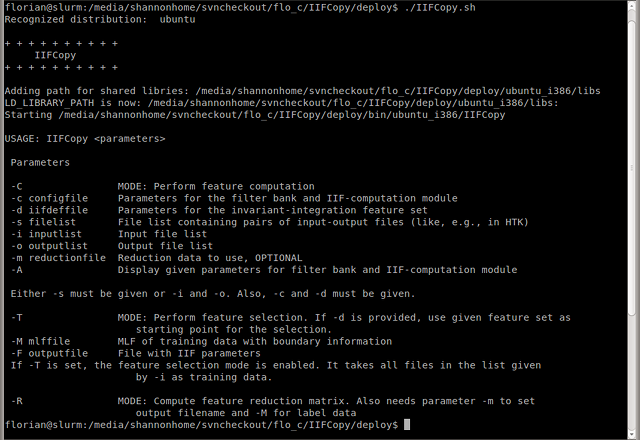 IIFCopy is a completely new (w.r.t the previously published C-version) written implementation for the computation, selection, and reduction of IIFs. The download provides binaries for different architectures and platforms together with IIF sets and reduction data as well as a documentation in the file README.txt.